Jojo's love for movement started at a very young age, growing up loving martial arts and wanting to be the fifth member of the Teenage Mutant Ninja Turtles. She heard of a class that gave an incredible workout from authentic martial arts skills and combos with really amazing music and had to try it. 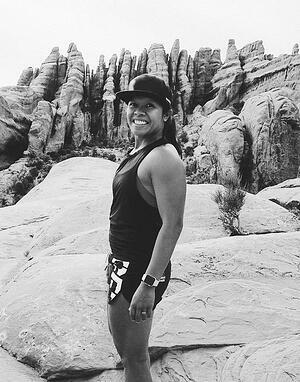 Les Mills BODYCOMBAT was love at first jab, sharing that same level of excitement, accomplishment and empowerment she felt the first time she stepped in to that class, with others, became her goal. Now as a certified Les Mills BODYCOMBAT, BODYJAM and GRIT instructor, her goal of motivating and inspiring anyone and everyone with movement through music and fun has been realized (pretty much a Ninja Turtle, so cowabunga dude!). When Jojo's not punching, kicking, training or dancing in the CAC studios, she's leading a creative team in downtown Chicago as their Creative Director. She's a home chef, a curious foodie, a doting wife, and a big believer in the power of positivity.